“You don’t seem so bad to me,” I said. The wild pig looked up at me for a moment then went back to plowing dirt with its snout. Its tail flicked back and forth. Dirt came up in thick clumps. People had warned me about them. Watch out they said. They have mighty tusks. They will run you into a tree. I didn’t believe much. There are no bears or wolves around to make up stories about, so wild pigs become the scary thing in the woods. Not even a grunt to respond. More tail flicks. More dirt coming up in clumps. I shifted positions to get a better look, moving behind a low wall. Then I saw the second pig. It had been hiding near a line of brush. Just as big as the first, it snorted and dug and flicked its tail too. On cue, a piglet came out, then another. I looked down at the wall between us and decided that I could junp up there if anything happened. Then a third piglet scampered out. A fourth. A fifth. They didn’t share the wiry, black haired coat of the adults. Sleek brown and black stripes ran down their stout, rounded bodies. They pranced and played with each other. Number six came out, then seven, then eight. 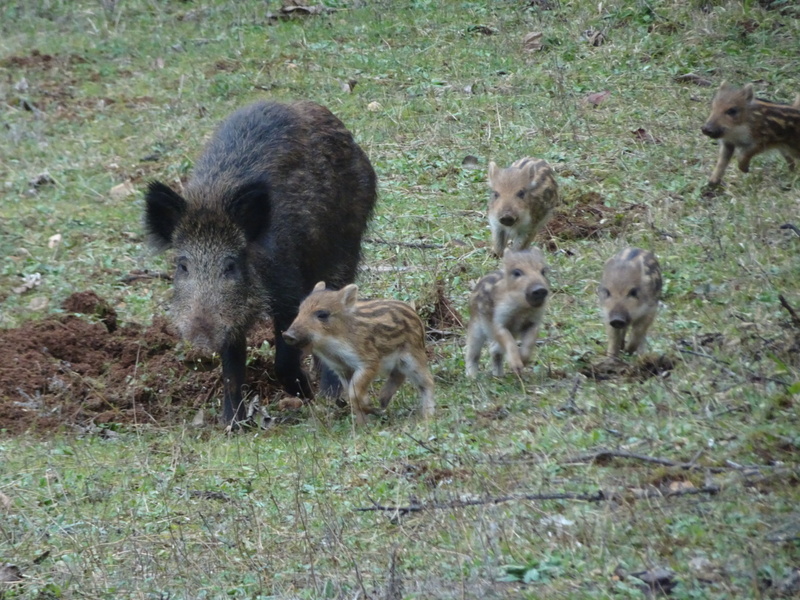 The whole horde of piglets rummaged back and forth into the ground, chased each other, caused cute chaos as the two adults plowed up earth and kept an eye on me. A car came rolling down the road. Heads shot up. Snouts raised high. Then the pack scattered away. Two Frenchmen jumped out and the three of us watched the pigs disappear. We looked at each other, grinning, happy to have seen them at all. Absolutely delightful!!! Loved the picture!!!! I am sure they recognized you as part Cuban and kept their distance. Did they look like dinner?